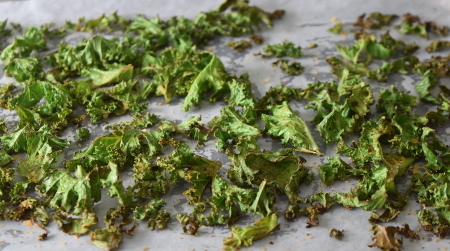 Crispy kale chips are one of my favourite snacks. With a spicy, garlicky seasoning and the smokiness from the barbecue, they really are a treat. The fact that kale is a leafy green also helps matters, meaning that this cheeky snack is in fact pretty good for you! I’d recommend making these for just a small group of people (or just for yourself! ), seeing as you can’t really make more than one tray of crisps at a time – as the kale shrinks, one tray only really makes enough for one or two people. They’re deliciously crunchy a few minutes after coming off the barbecue; I wouldn’t recommend making them far in advance as they won’t be crispy kale chips for long! Luckily they’re quick to cook and quick to prepare – not much effort at all! If you have one, I strongly recommend using an oil spray to coat the kale; it makes life SO EASY. The spray is fantastic for a light but even distribution of oil. Don’t have an oil spray? Fear not. Pouring a small bit of oil onto the kale and massaging it in with your hands does the trick as well. Of course you can alter the seasoning to your taste – if you’re not a fan of spice, maybe use some ground herbs instead of cayenne or paprika. You can also simply season with salt and oil if you just want to enjoy the earthy flavour of kale! For this recipe, you do need a barbecue with a lid because you’re creating an oven environment. You also need to use a heat deflector stone in between the charcoal and the grill to achieve this - this allows the crispy kale chips to cook more slowly so that they don't just burn. Serves about 4 people. Prep time: 10-15 minutes. Cooking time: 10-15 minutes. Heat your barbecue to around 150°C (302°F), using a heat deflector stone above the charcoal and below the grill. Tear the leaves of the kale off the stalk, and tear those into large pieces. Don’t tear them up too small, as the leaves will shrink and you’ll end up with kale crumbs! Mix together the seasoning mixture (nutritional yeast, sweet paprika, cayenne, garlic salt, onion salt and cracked black pepper) in a small bowl. Either spray or pour a bit of oil onto the kale – just enough for a light coating. If pouring the oil, use your hands to spread it throughout the kale to make sure there’s an even coating on every leaf. Gently sprinkle the seasoning mixture onto the kale, turning it over with your hands so that the seasoning coating is consistent throughout the kale. Line a baking tray with greaseproof paper and spread your kale out across it. If you have used a whole packet of kale, you will need at least two trays – in order for the kale to crisp up, it’s gotta be in a single layer on the baking tray. Place a tray of kale in your barbecue and leave to cook for 10-15 minutes. Check the chips after ten minutes, and if some of the smaller bits look coked, take them out and put them in a bowl, leaving the rest to cook for another few minutes. 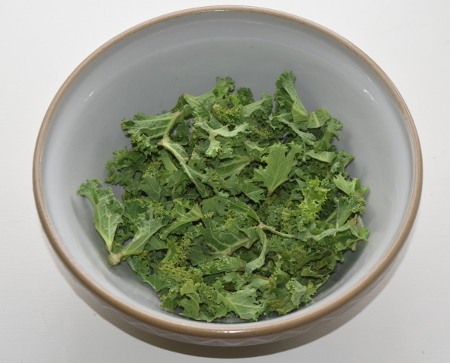 Take the kale out, and leave for a couple of minutes before serving – the kale crisps up as it cools! 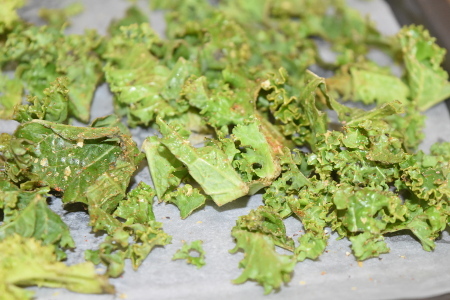 Enjoy your crispy kale chips as a tasty and healthy snack! What's so great about Kale anyway? Kale is not only tasty (especially as kale chips!) but as a green, leafy vegetable it is full of nutrition. However, I'm not a nutrition expert, so for more information about kale and its health benefits click here.